discover this Discover More Here Today – November 14, 2015 – marks the 50th anniversary of the Battle of Ia Drang, November 14-18, 1965. This was the first major action of the Vietnam War which saw American forces fighting the People’s Army of Vietnam (PAVN), also known as the North Vietnamese Army (NVA) rather than the Viet Cong guerillas. Walter Joseph “Joe” Marm was born on November 20, 1941 in Washington, Pennsylvania. He graduated from Duquesne University in May of 1964 and volunteered for the United States Army soon after rather than waiting to be drafted. He received an officer’s commission through Officer Candidates School and also completed the United States Army’s Ranger School. In July of 1965, he was assigned to the 1st Battalion, 7th Cavalry shortly before they deployed for combat in Vietnam. Then Second Lieutenant Marm landed at LZ “X-Ray” in the early afternoon of November 14, 1965. His platoon, with the rest of Company A, held a position along a dry creek bed while trying to reach one of their sister platoons who had been cut off by the enemy. When Lieutenant Marm’s platoon was blocked by an enemy fire team and then a well-protected machine gun, he attacked alone to clear the way ahead. He received the Medal of Honor slightly more than one year later. Citation: For conspicuous gallantry and intrepidity at the risk of life above and beyond the call of duty. As a platoon leader in the 1st Cavalry Division (Airmobile), 1st Lt. Marm demonstrated indomitable courage during a combat operation. His company was moving through the valley to relieve a friendly unit surrounded by an enemy force of estimated regimental size. 1st Lt. Marm led his platoon through withering fire until they were finally forced to take cover. Realizing that his platoon could not hold very long, and seeing four enemy soldiers moving into his position, he moved quickly under heavy fire and annihilated all 4. Then, seeing that his platoon was receiving intense fire from a concealed machine gun, he deliberately exposed himself to draw its fire. Thus locating its position, he attempted to destroy it with an antitank weapon. Although he inflicted casualties, the weapon did not silence the enemy fire. Quickly, disregarding the intense fire directed on him and his platoon, he charged 30 meters across open ground, and hurled grenades into the enemy position, killing some of the 8 insurgents manning it. Although severely wounded, when his grenades were expended, armed with only a rifle, he continued the momentum of his assault on the position and killed the remainder of the enemy. 1st Lt. Marm’s selfless actions reduced the fire on his platoon, broke the enemy assault, and rallied his unit to continue toward the accomplishment of this mission. 1st Lt. Marm’s gallantry on the battlefield and his extraordinary intrepidity at the risk of his life are in the highest traditions of the U.S. Army and reflect great credit upon himself and the Armed Forces of his country. Lieutenant Marm was evacuated from the battlefield and spent several months recuperating from his wounds. He returned to Vietnam as a Captain in 1969 and served in combat as a staff officer and company commander with the 1st Battalion, 8th Cavalry Regiment, also part of the 1st Cavalry Division (Airmobile). He retired from the Army in 1995 as a Colonel and is still living. Note: some information in this post not otherwise linked is from an interview conducted with Colonel Marm on November 13, 2015. That interview will be broadcast as part of Their Finest Hour on Vigilant Liberty Radio on November 14, 2015. As one of the Cadets at the United States Military Academy at West Point in 1972, we knew that a new faculty teacher was to instruct our new Psychology Class, but had no information on who, or anything about him. The first class of the semester snapped to attention as the instructor Captain entered & returned the salute. 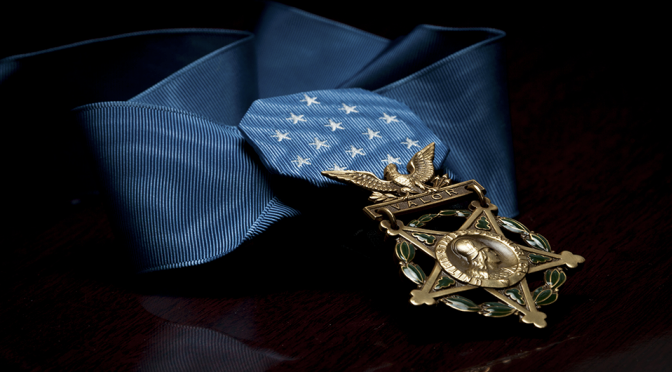 Quickly we saw the five-star blue ribbon of the Medal of Honor on the top row by itself. Not only was it there, but he was alive to wear it. Fascinating Psychology Class, particularly when, with appropriate class subject tie-in, we managed to have him explain his thought processes leading to the incident & specifically what he did. A rare & unusual honor, for recipients almost never discuss it. But, we insisted it was a psychology class & understanding the thought process was a part of the class. What an honor to have been part of that first class, and the later class discussions of his Vietnam leadership actions. For that class, Captain Marm was excellent–humble, patient, engaging, & very memorable. I have always considered meeting him an honor.